Old Farmer Gruff had a big herd of cattle. They mooed and they bellowed and made his bones rattle. "Get in behind!" hollered old Farmer Gruff to his three cattle dogs, named Scruff, Wuff and Tuff. When the work's done, the three cattle dogs scamper off to play. But TROUBLE lurks under the bridge ... look out for greedy monster Marakihau! 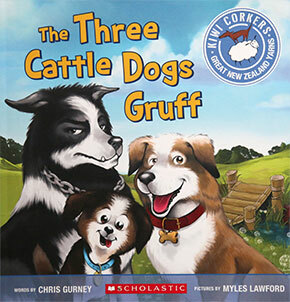 A lively New Zealand retelling of The Three Billy Goats Gruff. Once again, I needed to research Maori mythology to find out if there was a particular type of taniwha which may lurk in water under bridges. I discovered the marakihau. The legend of the marakihau is that they were mythical sea monsters, who had long tube like tongues which they sucked up their prey. They would harass and swallow shore-living people or sea travellers and their canoes, as well as fish. The marakihau is often seen in Maori carvings, particularly found in the northern and eastern parts of the North Island of New Zealand. Marakihau carvings often decorated the porches of carved houses. You can see an example of a marakihau carving. There are about 200,000 working farm dogs in New Zealand. These valuable working dogs muster thousands of sheep and cattle across hill and high country – a tough job that can't be done any other way. Check out this website to find out more about working farm dogs. 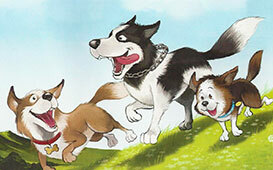 Do some research and see if you can figure out what breeds of dogs Scruff, Wuff and Tuff are. If you had three cattle dogs, what would you name them? FUN FACT - Dogs can hear things that we cannot. Most of us can hear a sound that is about 25 yards from us ... But dogs can hear sounds that are 10 times as far, 250 yards away! Read more fun facts about dogs and make a list of your favourite ones. Farmer Gruff was a dairy farmer. 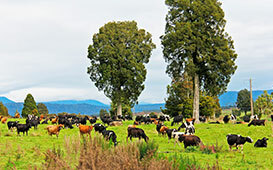 Dairy farming is New Zealand's most important economic activity. In 2015 there were over 5 million cows being milked in NZ. Here is a great little video which shows how a cow turns grass into milk. 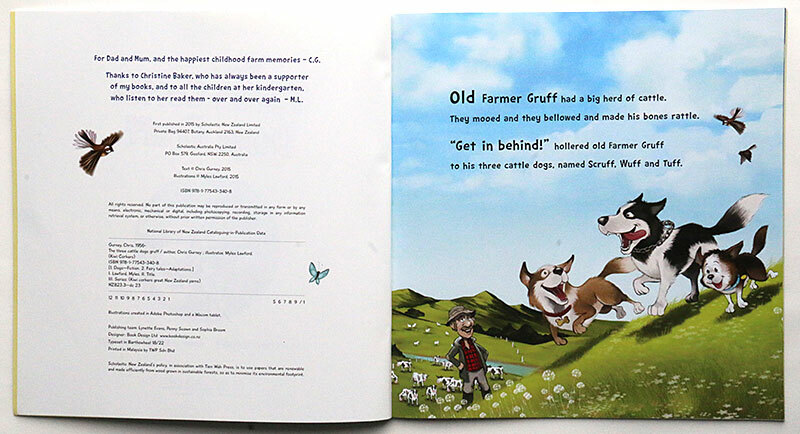 'The cows had been herded, the milking was done, So Scruff Wuff and Tuff scooted off to have fun.' What happens after the cows have been milked? How does the milk from the cows get turned into the bottles of milk we buy at the supermarket? The two most popular cow breeds in New Zealand are Jersey and Friesian. What breed does Farmer Gruff keep? Check out this video about different breeds of cows around the world. Life on a dairy farm changes with each season. Here you can find out more information about a dairy cow's year. 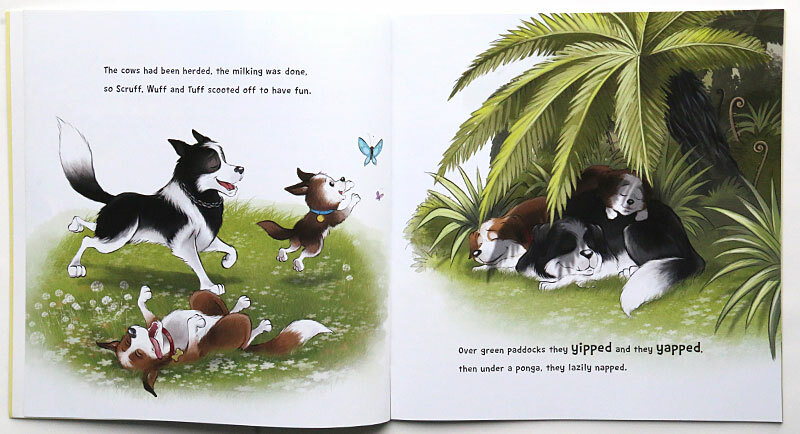 Throughout the book, can you spot the NZ native bird which appears on many pages? What is the name of that bird? How many times can you count it appearing in the book? Draw a picture of your own marakihau, with its long tube like tongue. Draw what it is your marakihau is sucking up. Here are three dog masks for you to colour in and make. Dog Mask 1, Dog Mask 2, Dog Mask 3. Maybe you could make them look like Wuff, Scruff and Gruff.